Beautiful child. Love your portraits of children. Absolutely fantastic. Beautiful and very professional. Congrats. Regards. Jan. Encantadora!, un retrato de gran belleza. 7/7. Wonderful set-up and capture Hussam ~ terrific work with a beautiful young model! 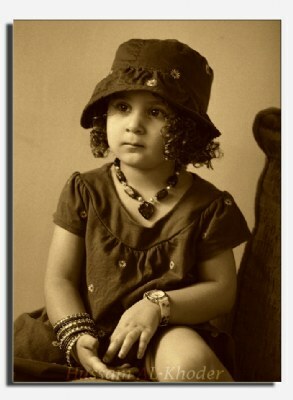 Amazing title and she really look severe here :))..god bless her..Amazing classique children portrait.. Brilliant portrait Hussam. I love the sepia colour. You did a nice job of recreating a retro look to this one Hussam. The sepia has a very pleasent look to it and the grain effect looks very much like the real thing. Nice composition and pose too. Bravo Hussam very excellent work, well done 7\7 . O will join the Rating. 7 of course. A very good portrait in a very professional style. 7/7. Yes she is pretty. Excellent portrait and image. Fantastic photo. Beautiful Sara.7/7.Wonderful, well done. Congrats. Regards. Jan. Very very distinct work here, Hussam! It really looks classic in all the sense of the word! The tones much the composition so well in that sense of "classicism" and the timing did also enhaced this character, as it got exactly that nice face expression that seems to be one of the main ingredients of this kind of photography. The well balanced contrast between the sharp focus on the face and the slight softening elsewhere is amazing! Still everything retained also its plasticity which again shows a very exact exposure balance. Adorable pose and expression, I like the vintage look of the image. Oh, here she is !!! She is a jewel indeed my dear Friend !!! And you made such a wonderful presentation of Her !!! A big kiss for Sara !!! Wonderful and sensitive portrait. Wonderful catch light and awesome tones in this capture. I like the drop shadow for the presentation. Excellent. Very beautiful portrait and looks pretty well and elegant in sepia!